Apple and Samsung have been embroiled in competitive battles for years now. The two brands dominate the premium smartphone market with Samsung trailing Apple considerably when it comes to tablets. Last year round about August 1, the Galaxy S4 tablet was released without much furor as is normally associated with their smartphone counterparts. The tablet measuring in at 10.4 inches across display was positioned as the flagship slate from the South Korean Tech giant. The device has a nice AMOLED display and features a glass back that has become a Samsung staple for their smartphone device. I am not too keen on a device this large with a glass back because of durability issues. I do not see how a tablet of this size can drop and not shatter its glass back. I do think this is something that Samsung along with Apple need to revisit with some of their devices. The glass back also quickly deteriorates with fingerprint smudges during use. With its display, you will need to crank up the brightness to 100 per cent while using the Galaxy outside in direct sunshine. The device costs about Shs2.4m, which is right about the amount you would pay for a fairly decent professional laptop with outstanding specs. The S4 comes with a Qualcomm Snapdragon 835 chipset, which is over two years old now, although it still holds its performance forte quite well. You also get 4 gigs of RAM with both the 64GB and 256 configurations, which is quite a step backwards as 2018 devices like the OnePlus 6T smartphone had over 8 gigs of ram. There is a micro SD card slot which gives you the option of increasing your storage to 512GBs. The S4 also runs on Android 8.1 Oreo. You also have the option of buying a Samsung keyboard for it which costs over Shs540,000. Yup you read it right. Many people that have bought the device end up buying aftermarket keyboards which start at about Shs130,000, so you can take the same route. The keyboard in itself works but is not all that great, especially at that price point. It does not have a premium feel and the keys are quite small to give fluid keyboard typing experience. The tablet comes with a stylus dubbed the S pen, which is very well constructed and is quite handy for sketching and taking notes. However, you will not be able to store it on the device unless you buy its keyboard which features a stylus holster. The device also has a desktop mode, which is called Dex. Coupled with a keyboard and a wireless mouse, Dex enables you to work sitting as you would before a laptop. The home button has been done away with to maximise screen real estate by using a thinner bezel. The battery has a capacity of 7300mAp, is great and will easily power through a full day of use on moderate usage. In terms of audio, you get four speakers one in each corner which is a good number and are able to produce fair decent surround sound. Maxing out the volume however produces slight deterioration that is hard to pick out. As has been with Samsung, you get a headphone jack that will allow you to plug in your traditional headphones as the kick back and watch some music videos or movies. You also get a 13Mega Pixel rear camera and an 8Mega Pixel front facing shooting which take pretty non-out-of-this-world kind of pictures. This is, especially true in low light where the photo quality severely suffers. 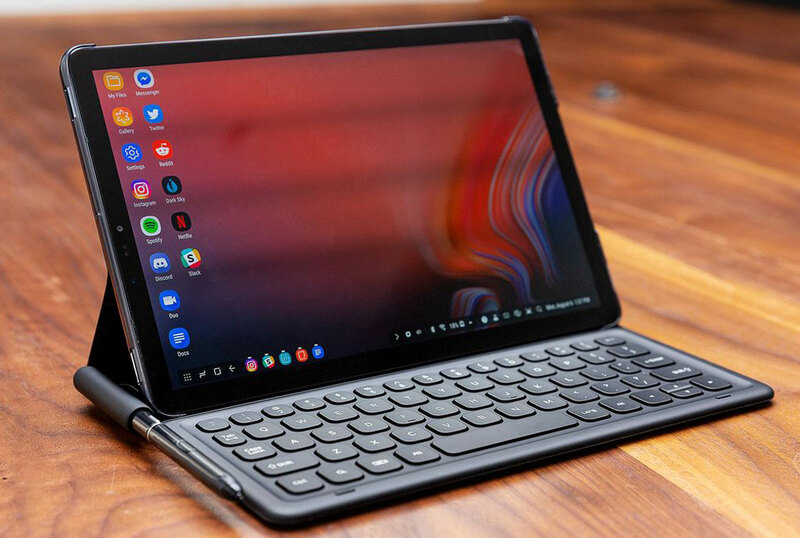 However, tablet manufactures have traditionally not gone all out when designing cameras for tablets because most users use their smartphones as their primary photography device.